Well, this is the second installment of my report from the front in the annual fall struggle with nature, although Saturday was the fourth battle in the long, hard slog to clear the multitudinous leaves from the grounds of our humble abode. This time, I have real photos of some of the prisoners taken (the photo at left is not of our house, although we have more leaves than the pile in the picture). It was a hard afternoon, though it would have been difficult to find a more pleasant one: mid-60s and sunny. 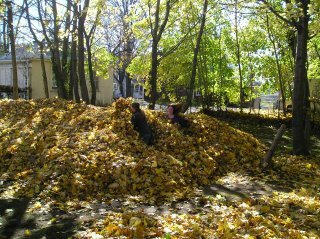 But I put in three hours of climbing around moving the leaves into piles and I decided I had earned myself a rest. So, at 4:00 p.m. I was out on the front porch cooling off. There’s something special about just kicking back with a good libation. Corky, our Beagle mix, was cooling it, too, sitting on the edge of the hill overseeing her domain. The squirrels were busy doing whatever it is squirrels do at this time of year. It was very pleasant. We’ve approached this project in different ways over the five years we’ve been in this house. The first two Diane and I personally took the project on with a rake and trash bags. It wouldn’t be so bad if we had a level yard, or even one with some trees in it. But no, when we bought this house, shortly before the onslaught of the leaves in 2001, we thought being surrounded by trees on three sides was an asset. And they are in the spring and summer when they pretty much shield us from the rest of the world, except on the fourth side, which looks across the street over our neighbor’s roof at the mountain in the distance. But after the leaves fell and we realized how much trouble we were in, it was too late. The folks we bought the house from, Ray and Lois, were very nice people, and they had built a nice little house on their double lot. The problem is that they had to carve out level land for the house to sit on from a substantially slanted hill and in doing so left a steep bank in the back of the house. Now Ray is an engineer, and he used his skill to design a series of tiers with landscape timbers and rocks to hold that bank, and in those tiers he put every conceivable type of flora that catches and holds leaves in the fall: You name it, Ray put it in. I’ve cursed him every year sometime during October. Twice we had people come in and do the work for us, but they didn’t do it like we wanted it done, and they were expensive. So this year, it’s up to me and this year I decided to try a new approach. 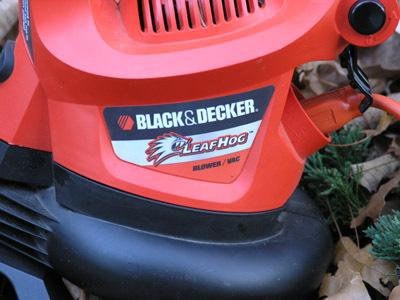 Instead of raking the leaves, a process that takes about 25 hours of work, I bought a new leaf blower/vac. I already had one, a gasoline model, but it just wasn’t up to the task. This new baby is a Black and Decker electric model that produces a 230 mph breeze that moves the deck furniture. The Big Wind Storm and Small Wind Storm blew through the area in October. The Big one packed winds approaching 60 mph and the Small one packed winds of only 40-45 mph. Dozens, perhaps hundreds, of twigs and limbs—some of which are stout ones—were blown down by these storms, and these twigs and limbs get mixed in with the leaves and get caught on things and generally make a difficult job worse. Unfortunately, the wind only blew more leaves into the yeard, and didn't blow many out of the yard. The rain and snow made the leaves wet, compounding/confounding the work to be done. The process is to get the leaves off the hillside tiers and onto the deck, then off the deck behind the house, and then blow them across the yard and over the hill into the woods. 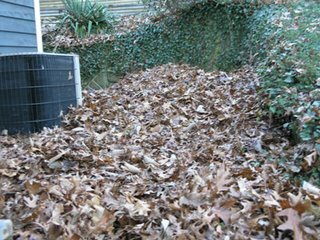 This photo shows one pile of leaves that is behind the house that is about 13 feet long, five feet wide, and 3-or-so-feet deep. That’s the second pile like that I gathered up Saturday, and it’s the eighth one this fall. Say what you will: That’s a lot of leaves! I’ve got at least three more piles that size to go, and then I get to move to the front yard. Compared to the back of the house, though, the front is a breeze. I knnow that I have everyone's sympathy! The good news is that the war will soon be over for another year.